According to Penn State scientists, a piezoelectric ceramic foam supported by a soft, elastic polymer support could enable a 10-fold increase in the capacity to harvest thermal and mechanical energy over regular piezoelectric composites. 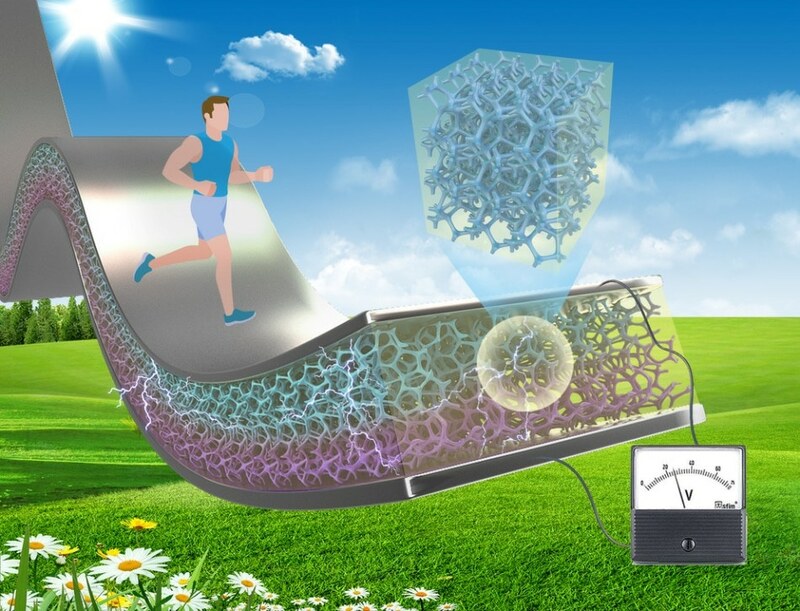 Researchers looking for methods to harvest small quantities of energy to operate sensors for health monitoring or run mobile electronic devices usually add hard ceramic nanowires or nanoparticles to a flexible and soft polymer support. The piezo nanoparticles transform the mechanical energy into electrical voltage, while the polymer offers the required flexibility. However, these materials are not highly efficient because when they are mechanically loaded, the bulk of the polymer largely absorbs the mechanical energy, while only a small fraction of energy is transferred to the piezo nanoparticles. Although energy efficiency can be increased by adding more ceramic, it comes with the added tradeoff of less flexibility. Almost 30 years ago, Bob Newnham, the late Penn State materials scientist, developed a concept, wherein the efficiency of the piezoelectric effect is determined by the connectivity of the piezo filler. Compared to what he classified as two-dimensional films, one-dimensional nanowires, or zero-dimensional nanoparticles, a three-dimensional material would be more efficient. This is because the mechanical energy will not be dissipated into the polymer matrix but would be directly transported via the three-dimensional material. "Bob Newnham was a legend in the field of piezoelectrics," Wang said. "so everybody in the ceramic community knew of his approach, but how to achieve that 3-D structure with a well-defined microstructure remained a mystery." What was believed to be the secret ingredient to explain the mystery ultimately turned out to be a low-cost polyurethane foam dusting sheet, which can be bought at any home improvement store. The sheet contains tiny uniform protrusions that serve as a template for forming the piezoelectric ceramic’s microstructure. The ceramic, in the form of suspended nanoparticles in solution, was subsequently applied to the polyurethane sheet. Upon heating the solution and template to a sufficiently high temperature, the sheet burns out first, followed by crystallization of the solution into a solid 3D microform foam with even holes. The holes in the ceramic foam are then filled with polymer. "We see that this 3-D composite has a much higher energy output under different modes," Wang said. "We can stretch it, bend it, press it. And at the same time, it can be used as a pyroelectric energy harvester if there is a temperature gradient of at least a few degrees." The other corresponding author on the paper is Sulin Zhang, professor of engineering science and mechanics, Penn State; the paper is featured in Energy and Environmental Science. The elaborate computational work replicating the piezoelectric performance of this 3D composite was carried out by Zhang and his students. "We were able to show theoretically that the piezoelectric performance of nanoparticle/nanowire composites is critically limited by the large disparity in stiffness of the polymer matrix and piezoceramics, but the 3-D composite foam is not limited by stiffness," Zhang said. "This is the fundamental difference between these composite materials, which speaks to the innovation of this new 3-D composite. Our extensive simulations further demonstrate this idea." Wang and his team are now working with more environmentally friendly and lead-free alternatives to the existing lead-zirconium-titanate ceramic. "This is a very general method," Wang said. "This is to demonstrate the concept, based on Bob Newnham's work. It is good to continue the work of a Penn State legend and to advance this field." Guangzu Zhang, formerly in Wang's group and currently at Huazhong University of Science and Technology, China; and Peng Zhao, a doctoral student in Zhang's group are co-lead authors on the article titled, "Flexible three-dimensional interconnected piezoelectric ceramic foam based composites for highly efficient concurrent mechanical and thermal energy harvesting". Xiaoshin Zhang, Tiankai Zhao, Kuo Han, Chang Kyu Jeong, Yong Zhang¸ and Shenglin Jiang are other contributors. The U.S. National Science Foundation, the National Key Research and Development Program of China, and the National Science Foundation of China funded the work.